How do you get a company from 5 million subscribers to 25 million subscribers? You flood the world with FREE Trial CDs and you test, test, test! That’s exactly what we did for America Online. 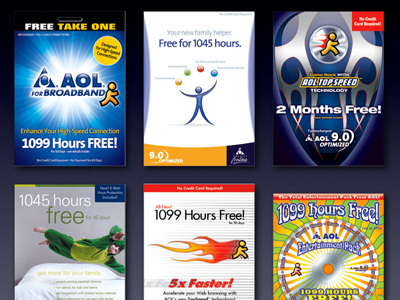 For over ten years, Dircks was AOL’s leading creative agency, creating high response rates not only in the thousands of direct mail packages we created, but also in other medias including advertising, in-store, outdoor billboard, interactive, multi-media and co-marketed promotions. The key to our success? The incessant desire to beat our own creatives time and time again. That means constantly analyzing test data and trend data and dipping it do a deep well of creative ideas and capabilities.